We’re pleased to announce that our top selling WooCommerce Product Table and WooCommerce Quick View Pro plugins work with several minimum and maximum quantity plugins. These allow you to control how many products customers can purchase from your product tables. See it in action on our demo page. 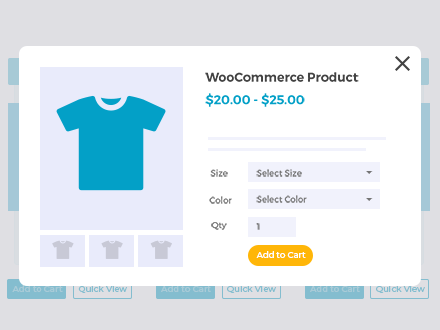 Whichever plugin you choose, you can use it with WooCommerce Product Table to list products in a filterable table and limit the quantity that customers can add to the cart. You can also use WooCommerce Quick View Pro to add quick view links to your store, making it easy for customers to learn more and buy without visiting the single product page. Some of the minimum/maximum quantity plugins add restrictions to the overall number of products in the cart. Others have more fine-grained control, such as letting you restrict the number of products from a specific category that can be purchased. I’ll tell you about how to use each one with our plugins. WooCommerce Product Table is a plugin created by ourselves at Barn2. It creates a flexible tabular layout for your WooCommerce products. You can choose which columns to display, add filters to the table, and much more. Table layouts can increase conversions on many types of WooCommerce store. It’s particularly popular for bulk order forms, wholesale stores, restaurant order systems, build your own product systems, and large product catalogs. Overall, it’s ideal for any e-commerce website where you want customers to be able to find products quickly and view more products per page. It’s also an easy way to list products with extra product data, without having to create custom layouts. Add the minimum and maximum quantities feature to your store today! What is WooCommerce Quick View Pro? WooCommerce Quick View Pro is another Barn2 plugin. 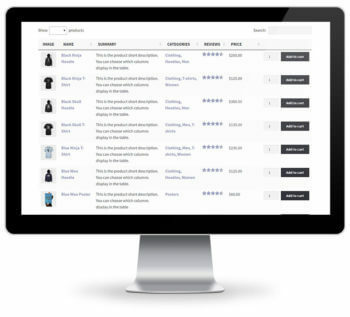 It adds quick view buttons or links to your shop and product category pages. Customers can use these to view extra images and information about each product. They can also select variations and add to the cart straight from the quick view lightbox. The quick and easy way for customers to explore and buy your products. Min/Max Quantities is the official quantities plugin from WooCommerce.com. It’s the most advanced limit cart quantity plugin featured in this article. As well as letting you set minimum and maximum quantities for each product, it also works with individual product variations. It even supports minimum and maximum order values, which is a real benefit for many stores. There are some extra bonus features such as the ability to set the minimum and maximum quantity globally or for individual products, and to exclude specific products from these rules. You can also use the plugin to force customers to buy in specific multiples – e.g. so that you can only buy a product in increments of 5. How does it work with WooCommerce Product Table? When you use Min/Max Quantities with WooCommerce Product Table, you are physically prevented from adding the wrong number of products to the cart. This works whether you add a global minimum/maximum quantity or value for the entire order, or if you control the quantities for individual products or variations. That’s how it lets you limit cart quantity in WooCommerce. The quantity picker in the product table will only show the available quantity. For example, if you set a maximum quantity then when you click the up arrow, you can’t increase it beyond the maximum quantity. If you try to override this and manually type a higher or lower number into the quantity box, then an error message will appear. An error message will also appear if you’ve set global rules for your store and try to add more than the maximum quantity to the cart. If your cart doesn’t contain the minimum number or value of products, then an error will appear in the cart telling you how much more you need to add. An error will also appear in the cart if you try to add more than the maximum value of products to your order. This happens in the cart rather than the product table, as that’s where the total order value is calculated. I set this variable product to have a minimum quantity of 2 and a maximum quantity of 5. 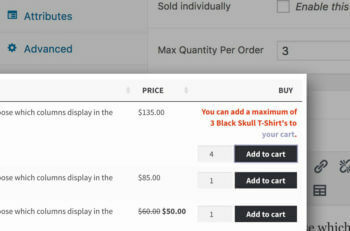 The Min/Max Quantities plugin won’t let me add more than the minimum or maximum number of products to the cart. There are two incompatibilities between the two plugins that we’re aware of. Please set up your product tables as follows to ensure they work correctly together. The only incompatibility we’re aware of is that the official WooCommerce Min/Max Quantities plugin doesn’t work with the add to cart checkboxes in WooCommerce Product Table. If you’re using the plugin to set a minimum quantity then you’ll need to use the standard add to cart buttons instead of checkboxes. You can either set the add to cart button type globally on the plugin settings page, or just in the specific tables where you’re using products with a minimum quantity. How does it work with WooCommerce Quick View Pro? The official WooCommerce quantity plugin works nicely with WooCommerce Quick View Pro. Customers will see a warning if they try to add an incorrect quantity to the cart from the quick view lightbox. If you set a minimum quantity, then this will appear as the default quantity in the quick view lightbox. YITH Woocommerce Minimum Maximum Quantity is a popular quantity limiting plugin with plenty of features. The main reason to use this rather than the official extension is because it supports category-level minimum and maximum quantities. I don’t know of any other WooCommerce quantity plugins that can do this. Specifically, you can use the YITH plugin to set a minimum and/or maximum number of products that can be purchased from each category. You can either do this globally for all your categories, or for each individual category as required. The YITH plugin also has the usual options to restrict quantities at the product level or for your whole store. However, the thing that makes it unique is its ability to restrict quantities within categories. When you use the YITH plugin with WooCommerce Product Tables, customers can add products to their cart as usual. If they are below the minimum quantity (e.g. the minimum quantity for a category is 2 and they add 1 product) – the product is added to the cart and a helpful message appears advising them that they must add more before they can complete the purchase. If they are above the maximum quantity (e.g. the maximum quantity for your store is 5 and they try to add 6 products) – a message appears advising them that they cannot add the products to the cart. Unlike the official WooCommerce Min/Max Quantities plugin, the YITH plugin works nicely with the AJAX cart feature in WooCommerce Product Table and add to cart checkboxes. If you want to use these features then we’d therefore recommend the YITH plugin. WooCommerce Quick View Pro works nicely with YITH’s quantity plugin. The only limitation is that if you set a minimum quantity for a product, then the default quantity in the quick view lightbox will still appear as 1. If you try to add a quantity of 1 to the cart then you will see an error message telling you the minimum quantity. As a result, you can use YITH’s quantity plugin with WooCommerce Quick View Pro, but it’s not quite as seamless as the official WooCommerce.com quantity plugin. WooCommerce Max Quantity is a free WordPress plugin available on wordpress.org. It’s very popular, well supported, and is used on over 4,000 websites worldwide. This WooCommerce maximum quantity plugin lets you limit the number of each product that customers can buy. You can either do this on a global basis (e.g. you can only buy 2 of each product), or on a per-product basis. When you use WooCommerce Max Quantity with WooCommerce Product Tables, customers can only add a limited number of each product to their cart. If you include an Add to Cart column with quantity selectors in the table, then each product will have an Add to Cart button next to a quantity box with up-down arrows. For example – perhaps you’ve given one or all of your products a maximum quantity of 3. The WooCommerce maximum quantity plugin will limit the up/down arrows to prevent customers from increasing the quantity beyond 3. If they manually type a higher number into the box, an error appears when they click the Add to Cart button. Visit our demo page to see the two plugins in action. Please note that the integration between the two plugins only works with standard product table Add to Cart buttons. The maximum quantities don’t work with the multi-select checkbox option, because this works in a different way. WooCommerce Quick View Pro works perfectly with WooCommerce Max Quantity. An error message appears when you try to add too many products to the cart from the quick view lightbox. Which maximum order plugin to use? For guaranteed stability and long-term support, I recommend the official Min/Max Quantities plugin. If you need to restrict quantities at category-level, then use the YITH plugin instead. YITH is also a reputable plugin company, so you will be safe with either plugin. You could use the free WooCommerce Maximum Quantity plugin if you simply want to set a maximum quantity of products that will apply globally across your entire site. However, it’s very limited and most people want more fine-grained control. Where can I get the plugins? It's Possible To Have The "Add To Cart" Button Turn On When At Least Of A Mimimum Variable Product Is Selected When In A Single Product Page And A Table Of Products Variation Is Displayed? Unfortunately this isn't possible - instead, an error appears if you try to add products to the cart before selecting the minimum quantity.